The inspiration of this work comes from the fountain water. Water is changeable, soft, free and full of the passion. I want use the carving to express the abstract desire──the harmony. That is the most beautiful part of human being’s emotions. because it always moderate and bring us endless gratification . 2016-Solo Exhibition “‘Time Travel” in Hualien Stone Sculpture Museum, Taiwan. 2013-First Exhibition of Chinese Contemporary Abstract Sculpture in China. 2012- NDHU Public Art Group Exhibition in Hualien,Taiwan. 2012 -Miyazaki Airport International Sculpture Exhibition in Japan. ‘Autumn the exhibition at the Museum,PENZA Russia. 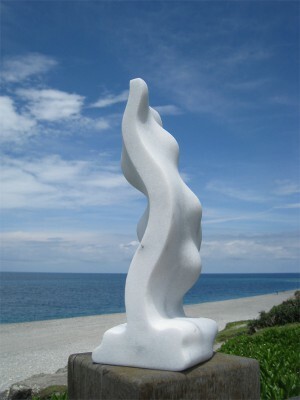 2011- Hualien Stone Sculpture Association Collective Exhibition,Taiwan. 2010-Solo stone sculpture exhibition in National Taitung University in Taiwan. 2009- Neo Impression Competition of stone Sculpture Exhibition. 2007- The Exhibition of Museum Collection. 2006- Fête de la lumière des Artists, Taipei. 2005-“New Perspective Art” Collective Exhibition in Taiwan. 2003- Hualien Stone Sculpture Association Collective Exhibition,Taiwan. 2003- International Celebrity Sculpture Invitation Exhibition of Hualien,Taiwan. 1997-‘Young Designers’ Exhibition in Taipei,Taiwan. 2012- National Dong Hwa University Public art,Taiwan. 2008- Hsinchu County History Museum Public Art,Taiwan. 2016-International Simposium of Sculptures Juan José Castelli Chaco,Argentina. 2016-International Biennial of Sculptures Resistencia Chaco,Argentina. 2016-Te Kupenga International Stone Sculpture Symposium,New Zealand. 2013-KARŞIYAKA Municipality II. International Stone Sculpture Symposium,Turkey. 2012-13th CHINA Changchun (Jingyue Area)International Sculpture Symposium. 2012-NDHU Public Art International Sculpture Workshop,Taiwan. 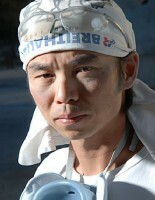 2012-International Luleburgaz Stone Sculpture Symposium,Turkey . 2011- International Kartal Stone Sculpture Symposium,Turkey . 2011-The 4th International Sculpture Symposium AUTUMN.Inspiration Penza. 2010-The 8th International Mersin H.Gezer Stone Sculpture Symposium, Turkey. 2009-The 5th China (Hui’an)Carving Art Festival & International Stone Carving Competition. 2007-2nd International Marble Sculpture Symposium of the town of Grasse. 2005-V International Symposium of Sculpture in Brusque,Brazil. 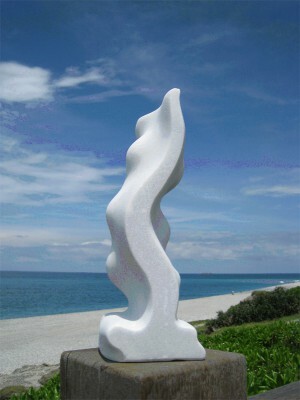 2003-Hualien International Stone Sculpture Symposium,Taiwan. 1995-International Vocational Training Competition-Stonemasonry,Lyon of France. 1993 first prize,24th National Skills Competition ,Stone Carving,Taiwan. 2008 first prize, Hsinchu County Museum of Public Art,Taiwan. 2012 National Dong Hwa University Sculpture Park,Public Art,Taiwan. 2015 1st prize,7th Tehran International Sculpture Symposium,Tehran,Iran.